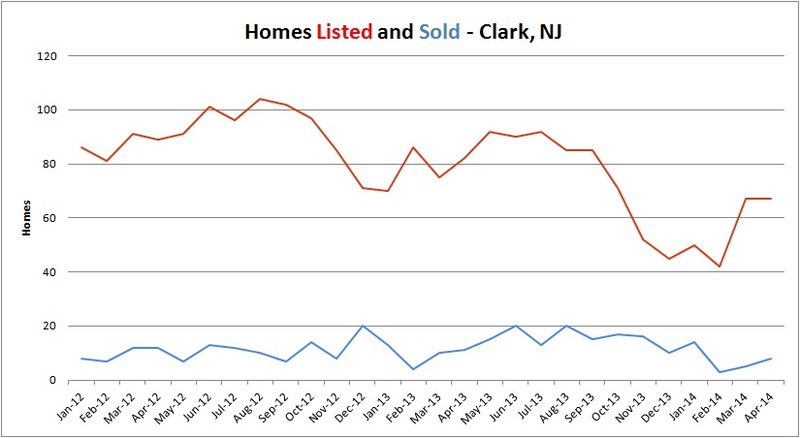 What happens to home prices in Clark when inventory drops? Clark, NJ is home to about 15,000 people. Students in Clark attend Frank K. Hehnly Elementary School or Valley Road Elementary School, Carl H. Kumpf Middle School for grades 6 – 8, and Arthur L. Johnson High School for grades 9 – 12. As of this morning, 35 homes are curently offered for sale in Clark. This is significantly lower than Clark has seen in more than 2 years. Typically, this drives prices up as supply is not large enough to meet demand. And that is exactly what we’re seeing. As inventory dropped, prices have risen. The average sale price in January of 2014 was $421,308, almost 22% higher than in January of 2012. Home sales are slightly slower than they were in December, but January is typically a slow month for homes sales. 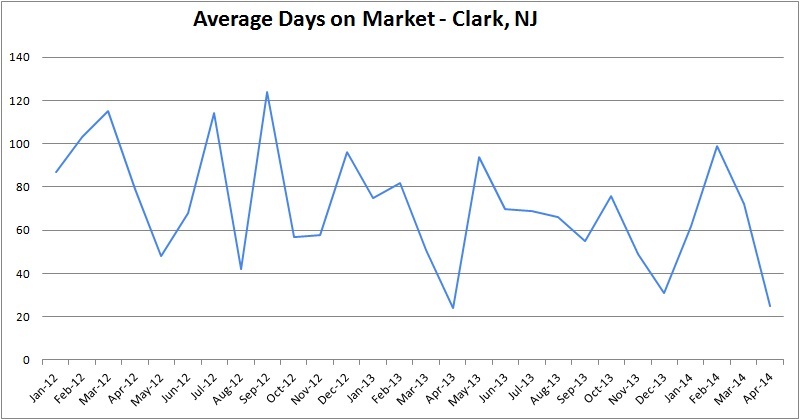 The average sold home in Clark in January was sold after 62 days on the market, about one third faster than in January of 2012. If you’re thinking of buying a home in Clark, here are the current listings. After you’ve chosen your favorites, contact us to schedule your showings! If you’re thinking about selling your Clark home, get a free Comparative Market Analysis here. Garwood is a borough in southern Union County and is home to roughly 7000 residents. The 400 elementary students in Garwood all attend Lincoln School. Garwood high school students join Clark students at Arthur L. Johnson High School in Clark. There are currently 6 homes offered for sale in Garwood, ranging in price from $245,000 to $379,000. Two homes were sold in December which is about average for the year. Inventory fluctuates in such a small town – the peak inventory was 21 homes on the market in September of 2013. As spring nears, likely the inventory will increase. 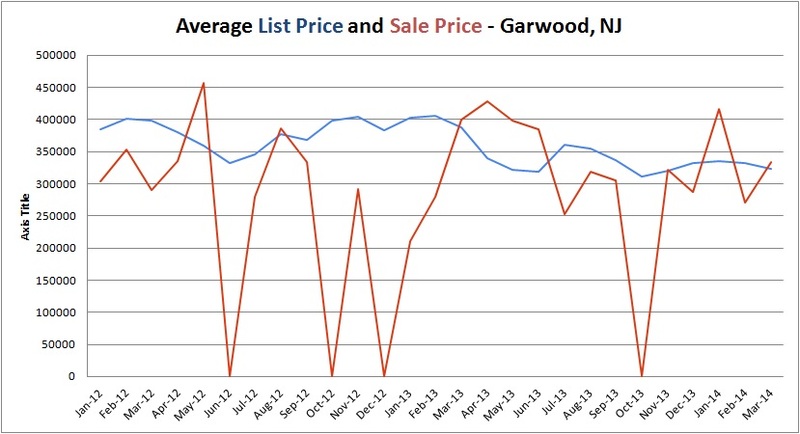 Prices in Garwood appear to fluctuate more than they actually do. The low valleys you see in the graph are months when no homes were sold. 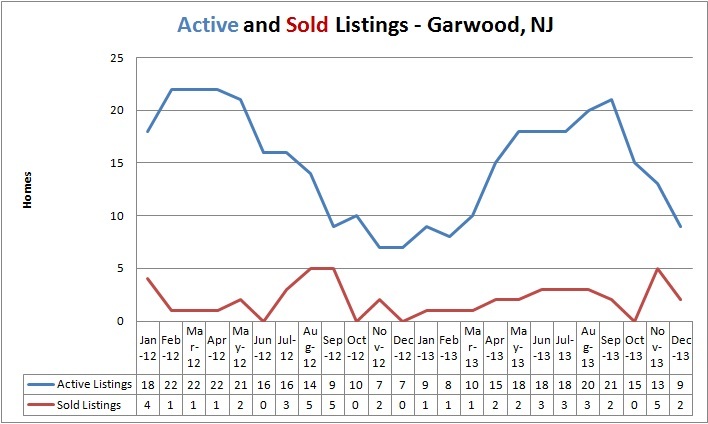 The average sale price of a home in Garwood in December was $287,700, about 12% lower than the 2013 average. There are currently 117 homes offered for sale in Westfield, about 20% lower than in October and nearly 50% lower than the summer’s inventory. 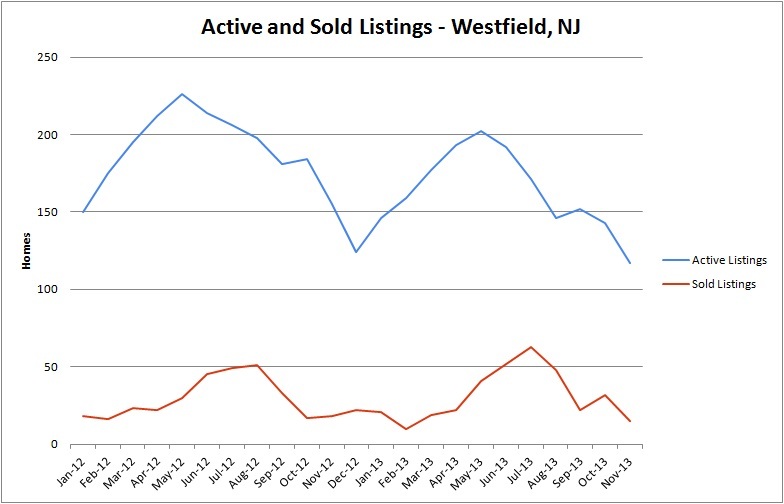 Only 15 homes were sold in Westfield in November, compared to 63 that were sold in July. 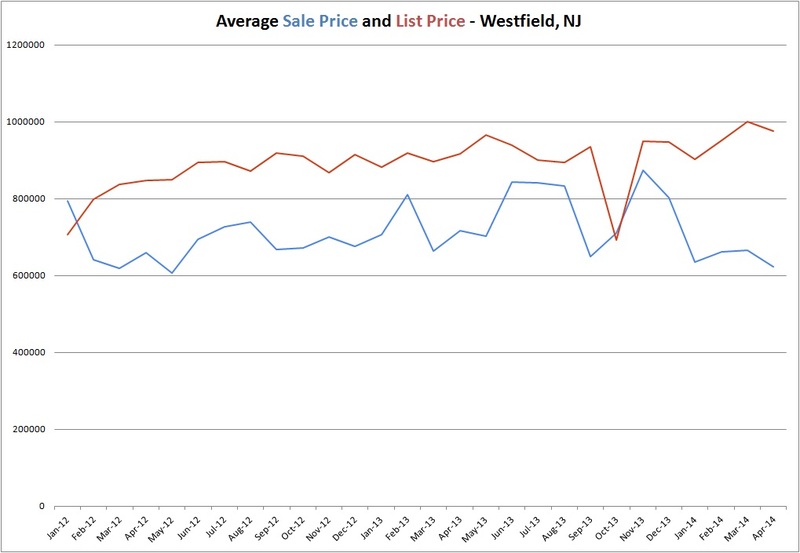 While the inventory is down, prices in Westfield have been going up. The average price of a home sold in Westfield so far in 2013 is $759,218 but the average home sold in November was sold for $874,563. Compare that to the average home sold in 2012 which was $683,126 and you’ll see why homes in Westfield are in high demand. For a free market analysis of your home, please email us at TeamZuhl@gmail.com.